She smiled again…and my heart melted. Did the last few words give you goosebumps? Yeah, they did that to me too, the first time I read that line. Let’s imagine this. You are in a coffee shop and suddenly you come face to face with your death. Spooky! Isn’t it? But, that is how this book starts. However, contrary to your vision of death in the form of a ‘Yam-Doot’, death meets the protagonist of the story in the form of a beautiful damsel – one who likes her coffee with a smiley on top. The first thing that catches your attention about this book is the size; it is a mere 54-page novella – just right if you want to carry in your purse around for reading. 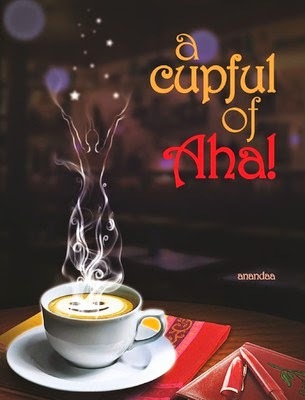 Then you notice the cover, an alluring cup of steaming coffee which forms a pattern of a beautiful lady over it dotted with shooting stars over it. The book has a philosophical premise and touches the various facets of our life. All our life we are slogging hard to reach our goals, earn money, etc., but when faced with death all seems meaningless. The book aspires to explore the deepest mysteries of life in a different perspective. It challenges our well set notions and ideas and tries to look at them in a new light. The writing style is witty, engaging and quirky. However, I did feel that the book gets confusing at times. Also, in summarizing such a potential topic in the concise book, the author didn't really do full justice to it. It was thought-provoking in parts and was a quite interesting and easy read. I hope the author will delve deeper into the mysteries of life and will come up with something more elaborate. A special mention about the author’s bio, which is as unusual as it can get. I take the liberty to quote it here from the book. The author is possibly the only double PhD (one in Applied Psychology, the other in Comparative Tribal Music) who has spent multiple stints in several rehabilitation centres for problems ranging from drug abuse, mental breakdown, and schizophrenia. He then spent 8 years roaming the remote regions of the Himalayas - living with goatherds and monks and often going several months with not a word spoken. At ease with Prime Minister and commoners like; he has the unique ability to predict key events of your future just by looking at a photograph of your little finger. PS: None of the above is true. The author is just the average John (or Jani or Janardhan). Does not matter. I received the book from BecomeShakespeare.com in exchange for an unbiased review.